The Rugosa Rose Red Shrubs hedge shrub roses are wonderfully fragrant blossoms that repeat throughout summer on this selection of the Rosa rugosa species. Blossoms of the Red Rugosa Roses are followed by very large orange-red hips in late summer and last all winter. Bumble bees are always visiting the blossoms on this flowering shrub rose. Great choice for a flowering shrub hedge. The Living Fence Rose has heavily scented large flowers usually deep pink to red, June to August producing seed pods (rose hips) which ripen August to October. Red Rosa Rugosas grows at a rate of up to two feet per year and will grow up to 6 feet tall. This plant is excellent for fast growing hedges. Disease resistant and winter hardy to Zone 2. Suitable for most any well drained soil. Space plants 3 feet apart in the row to create a fast growing hedge. In warmer climates, such as zone 8, this plant may keep its leaves over mild winters. Plant in full sun for best results. As with other roses, the rosa rugosa may not bloom as well in spaces with the sun being blocked. 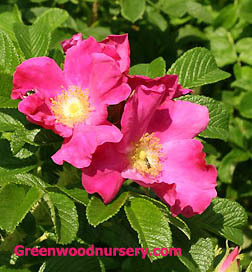 Rugosa Rose Red Shrubs ship as one to two feet tall bare root field grown plants. One order contains 5 plants.